were thwarted by her tongue. "Wow. We have a really docile child." "Here. 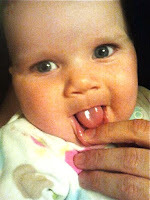 Put your finger along her gums." I see one tooth. I feel two teeth. Huh?! She's only 5 months old! She can't even sit up and now she's getting teeth? She was a bit fussy this weekend but I thought it was from traveling - it's from the enamel emerging from her gums. I've been feeding her cold(ish) solid foods to help relieve her drooling. I think it also helped numb some of her pain. She also has a teething ring that we can freeze and a mesh food pop thing that can hold frozen foods. The baltic amber teething necklace that we purchased for her is amazing. Because she has no neck, we've been putting it on her ankle and tucking it into her sock so it doesn't fall off. I'm not sure if the magical jewelry is the reason she's so calm but it I know it didn't hurt. $17 is a great price to pay for a calm, teething child.